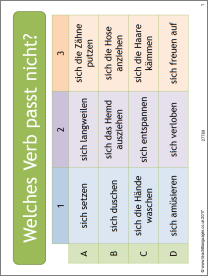 This resource introduces students to a wide range of reflexive verbs, including those which take dative pronouns. It includes a starter, four in a row game and dominoes. Very useful, I used it with my adult learners and will use it with my GCSE students, many thanks!